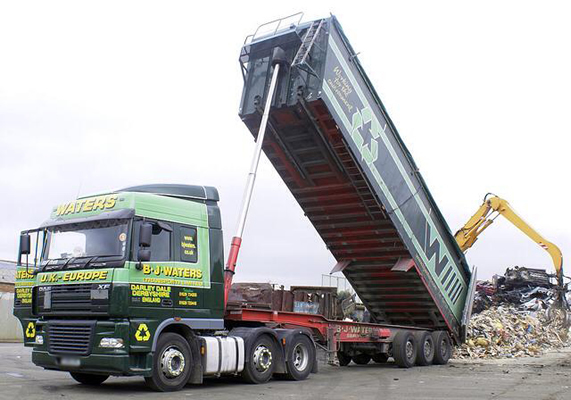 Tipper Hire Service in the UK & EuropeAs specialists in tipper vehicle services, BJ Waters boasts a comprehensive range of bulk tippers to suit different material handling requirements, made with aluminium, steel and stainless steel. Tippers can have either barn doors or tail gates, fitted with easy sheets/nets and an on-board weighing equipment. Rest assured that you will receive the same high quality of service that we have maintained for over 70 years. For clients across the UK and EU, we collect and deliver bulk materials on time and within your specified budget. All of our tippers are regularly maintained in-house to make sure operations are always safe and secure. If you have aggregate, waste paper, sand or gravel to be handled in bulk, tipper trailers are the most effective option. The materials can be securely contained then released directly from the vehicle to their intended location. To find out more about our tippers and bulk handling services, call 01629 734205 or email sales@bjwaters.co.uk.